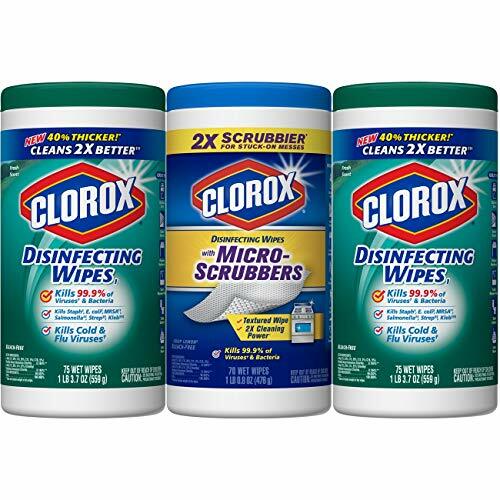 With two canisters of Clorox Disinfecting Wipes for everyday cleaning and one Clorox Disinfecting Wipes with Microscrubbers for scrubbing through tough, sticky messes, this variety pack provides a total of 220 wipes for use throughout your home. Keep the multiple canisters of disinfecting wipes throughout the house so they are easily accessible where you need them when you need them. The cleaning wipes kill 99.9% of flu viruses, bacteria and allergens and are great for seasonal cleaning needs like Back to School and Cold and Flu. Clorox Disinfecting Wipes are disposable and can be used on many hard non porous cleaning surfaces throughout the house including sealed granite, stainless steel, tile, finished wood and more. Use as a convenient kitchen wipe, a handy bathroom wipe for those little messes or as a sanitizing wipe anywhere in the house. Simply pull out pre moistened surface wipe to clean and disinfect in one swipe. It's that easy. Clorox Disinfecting Wipes and Clorox Disinfecting Wipes with Microscrubbers are sealed to guarantee no leakage during shipping. When you receive your wipes, simply cut protective seal and begin to use. If you have any questions about this product by Clorox, contact us by completing and submitting the form below. If you are looking for a specif part number, please include it with your message.